Hospice of the Red River Valley is committed to making educational and support opportunities available to our communities. We are offering grief support programming in several communities this fall, including Fargo, LaMoure and Valley City, N.D., and Detroit Lakes, Crookston, Halstad, Perham and Thief River Falls, Minn.
We are committed to making educational and support opportunities available to our communities. Registration is required for all classes because space is limited. All classes listed are offered free of charge; however, donations are always welcome to help offset the costs involved. Register for classes below or call (800) 237-4629 and ask for the bereavement department. Click for more information about each class. Hospice of the Red River Valley also offers a variety of support groups at several locations. It is our hope that these programs will equip attendees with a better understanding of grief and loss, as well as a place to find others who have shared a similar experience. If you have any questions, please feel free to contact us at (800) 237-4629. 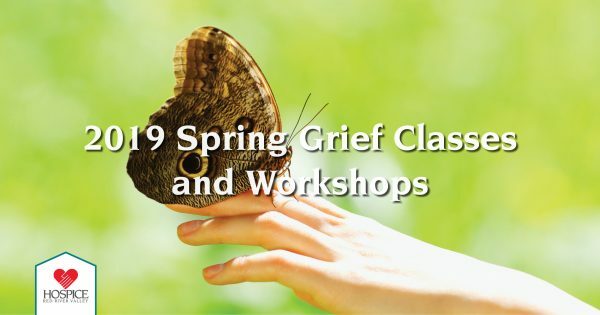 Click to download and print a complete 2019 spring grief class listing.